Perched high in the Serrania de Ronda Mountains in the region of Andalusia of southern Spain, Ronda is also known as ‘the Eagles Nest’, and is famous for its dramatic views of the El Tajo gorge. This historical city is the home of where everything quintessentially Spanish, from Flamenco to bullfighting. The walls that surround Ronda were built by the Moors in the 13th century, and was one of the most securely defended settlements of its time. Even though some of the outer walls have fallen, to this day there are only a few ways to exit this fortress city. 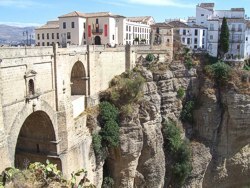 The main attraction for most visitors is to walk along the 18th century Puente Nuevo Bridge, which crosses the El Tajo gorge. Here you can gaze down at the jaw dropping views of the 120m chasm below. Each year there is a pilgrimage in Ronda called Virgen de la Cabeze, where colour and festive music fills the streets. A procession carrying the Virgin of the Head statue from the La Merced Church crosses the Puente Nuevo Bridge, and many of the followers are dressed in traditional costume, including the flamboyant look of flamenco. Ronda is the birthplace of modern bullfighting. In the 18th century the legendary matador Pedro Romero broke away from traditional bullfighting on horseback, and created the impressive style we know today of challenging the bull on foot. Once a year Ronda hosts the Corrida Goyesca, which is a very historical bullfight that takes place at the Plaze de Toros de Ronda, the oldest bullfighting ring in Spain. It is not hard to imagine why this spectacularly romantic city attracted such famous creative minds like Orson Wells, George Elliot, and Ernest Hemingway, who claimed its history and beauty inspired some of their work. Indeed, Ronda was featured in Hemingway’s novel ‘For Whom the Bell Tolls’. National monuments such as the bell tower of the Minaret, the church of San Sebastian and the Mondragon Palace are but a few you should not miss. Beyond Ronda are the ruins of Acinipo, where you can explore the prehistoric paintings of the Pileta caves. The caves date back 5,000 years and first discovered on a local farm in 1905. To this day the land owner’s family still take visitors on tours by candlelight. However be warned, this 2 kilometre cave system is not recommended for those who have a fear of enclosed spaces or bats! If that is the case, you may prefer the open spaces of the Nieves and Grazalema Nature Parks instead, that can be seen either on foot or on horseback. 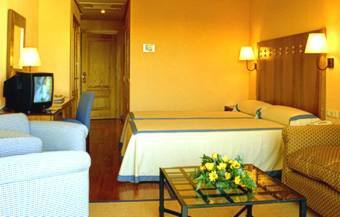 If you are looking for accommodation, the Parador Ronda will be the most memorable. Located right next to the Puente Nuevo Bridge and El Tajo gorge, guests can admire the view from their bedroom window and, if you care to lounge by the poolside, it also has fabulous panoramic views of the mountains beyond. The Parador has a huge selection of rooms, and the restaurant serves both Andalusian specialties and international cuisine, including a gluten free menu. 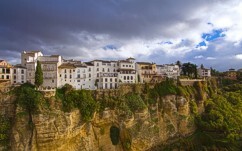 With regular flights into Malaga, getting to Ronda could not be simpler as there are trains, buses and taxis. Andalusia has so many wonderful cities to explore, so should you decide to hire a car and tour about, Ronda would be the perfect place to start. .